In stock -This product will ship today if ordered within the next 12 hours and 22 minutes. A refreshing alternative to milk. Rude Health`s Brown Rice Drink balances the delicacy of Italian brown rice with all its fibre, balanced with pure mountain spring water and cold-pressed sunflower oil. Silky white and subtly sweet (naturally so), this is the only rice drink made with whole-grain, brown rice. Virtuous and velvety. Natural Spring Water, Organic Brown Rice (17%), Organic cold-pressed Sunflower Oil, Sea Salt. Use with cereals, add to coffee or tea, add to a smoothie or shake, or even bake with cakes or muffins. 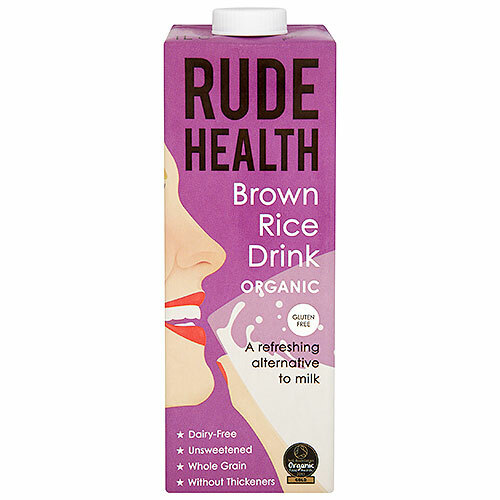 Below are reviews of Rude Health Organic Brown Rice Drink - 1 Litre by bodykind customers. If you have tried this product we'd love to hear what you think so please leave a review. Enjoy the delicacy of Italian brown rice with all its fibre, balanced with pure mountain spring water and cold-pressed sunflower oil.